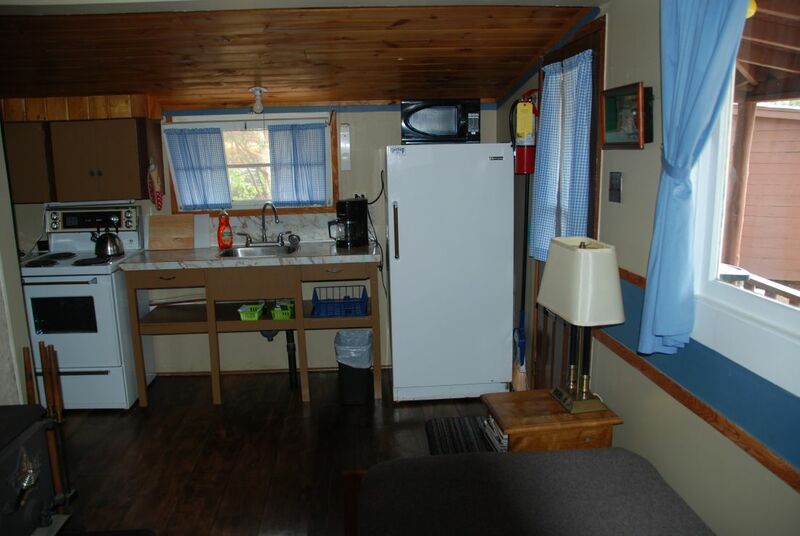 All cottages have hot and cold running water and are equipped with full kitchens including refrigerator, stove, oven, microwave, coffee maker, toaster, BBQ, pots & pans, dishes & utensils. 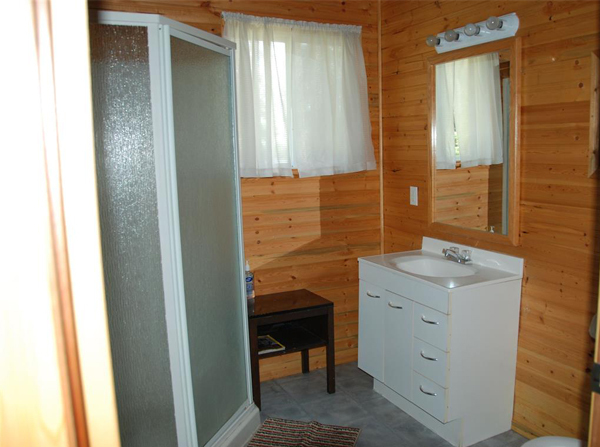 All cottages have bathrooms with toilet, sink, and shower stall (except the Hawk’s Haven has a jetted bathtub). 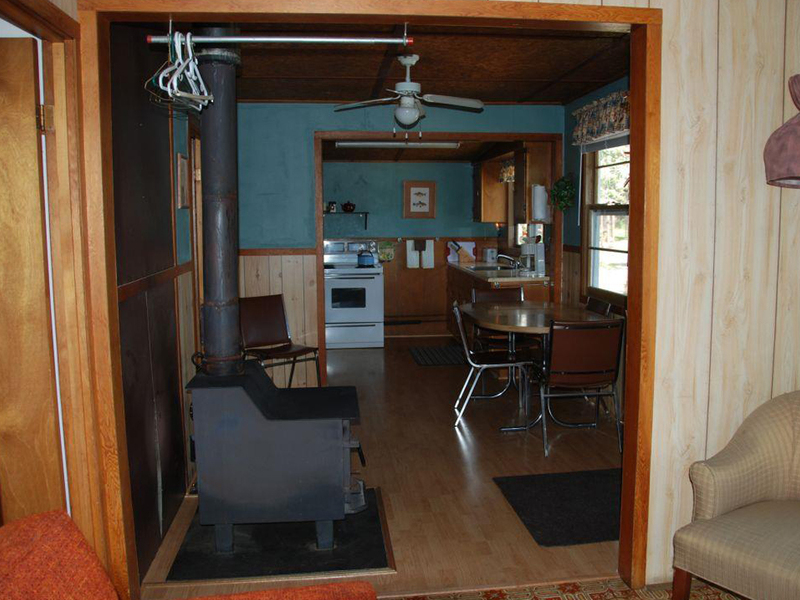 Three cottages have electric or gas heat – Hawk’s Haven, Pine View, Fox Hut – and all but the Pine View have woodstoves. 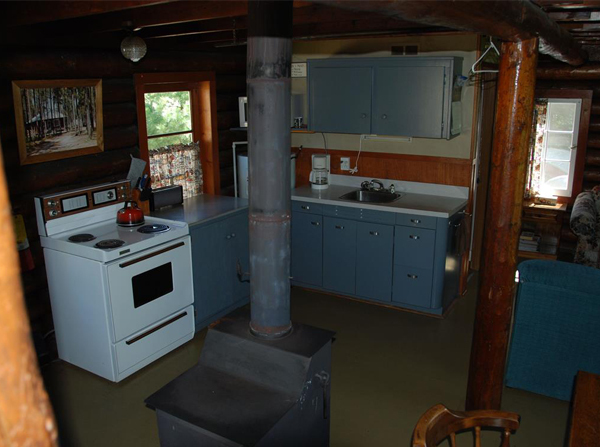 Rustic two bedroom cabin built from vertical logs. 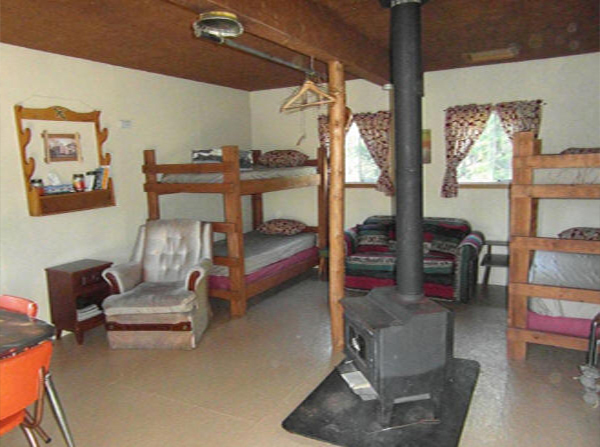 1 Queen Bed, 2 Doubles, 1 Single, a pull-out sofa, a woodstove and two closets. 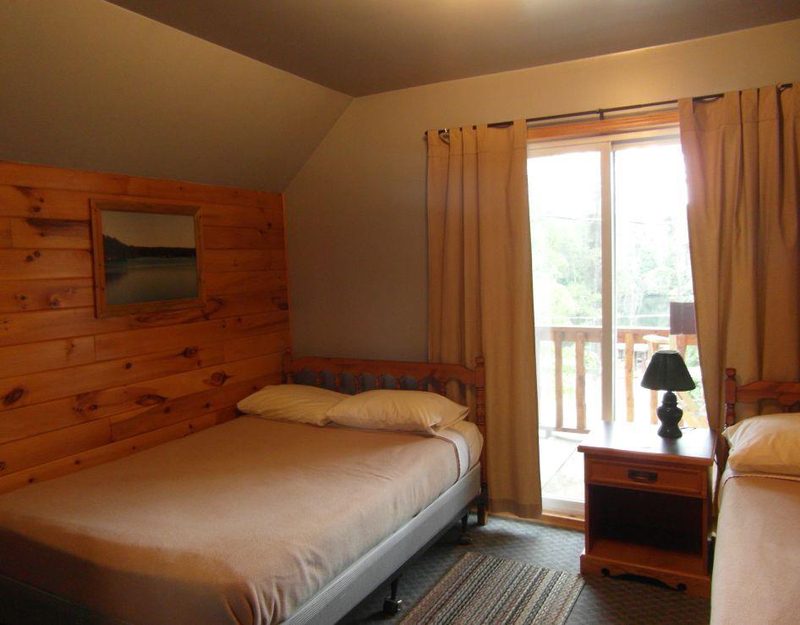 Nice view of the water. 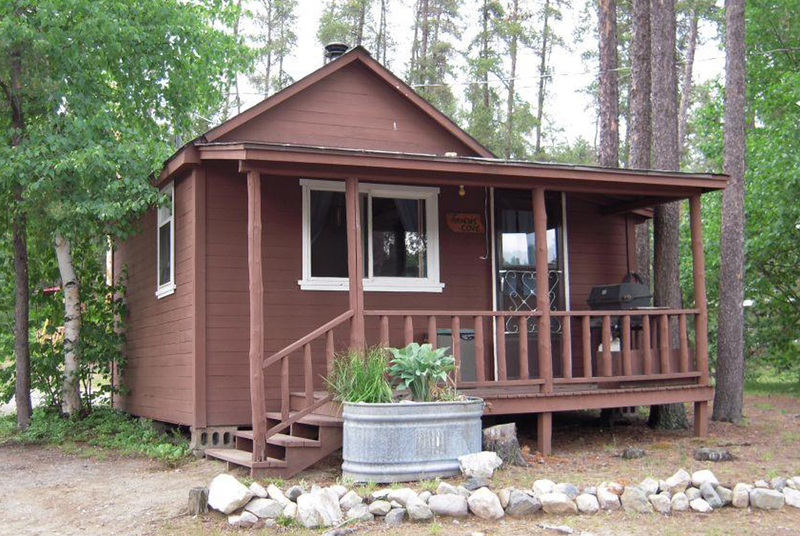 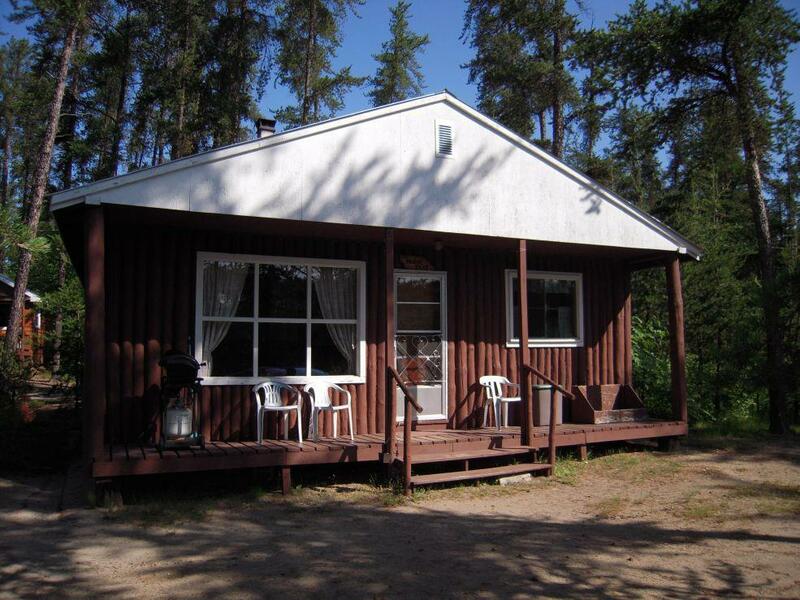 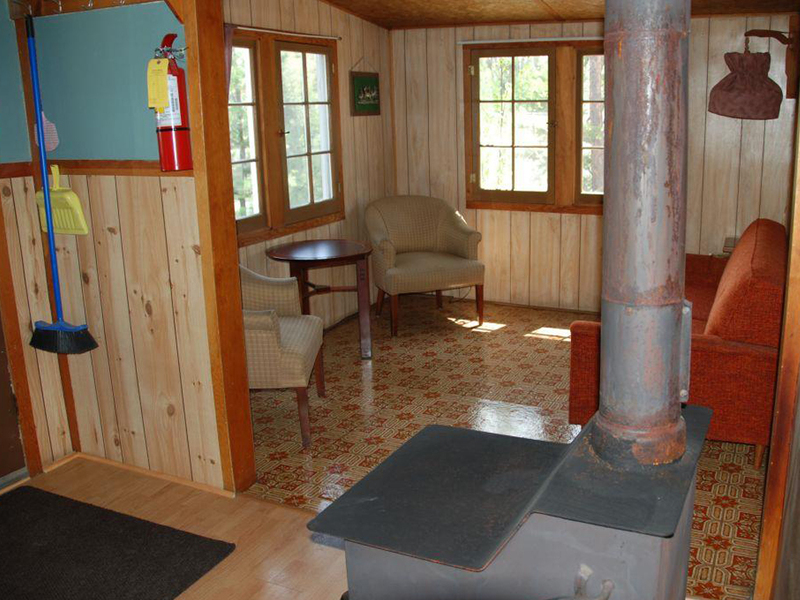 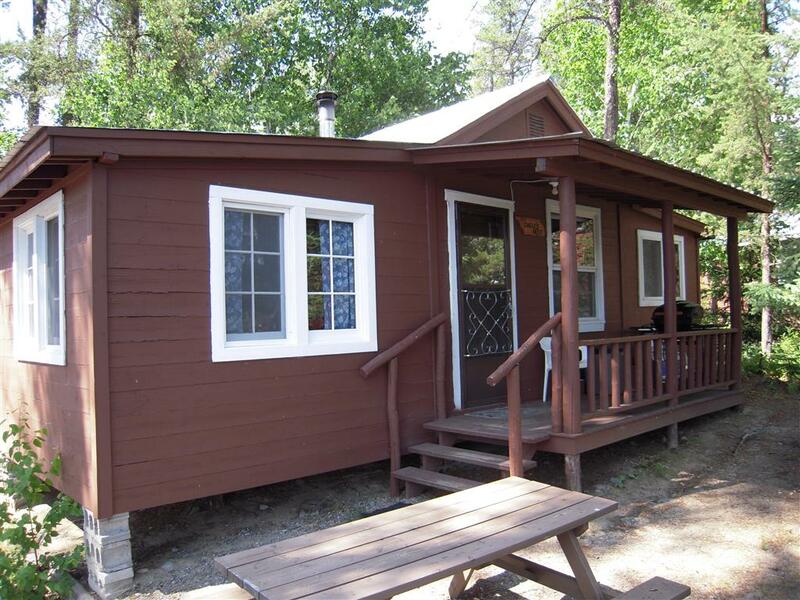 This modern two bedroom cottage is fully winterized with electric heat as well as a woodstove. 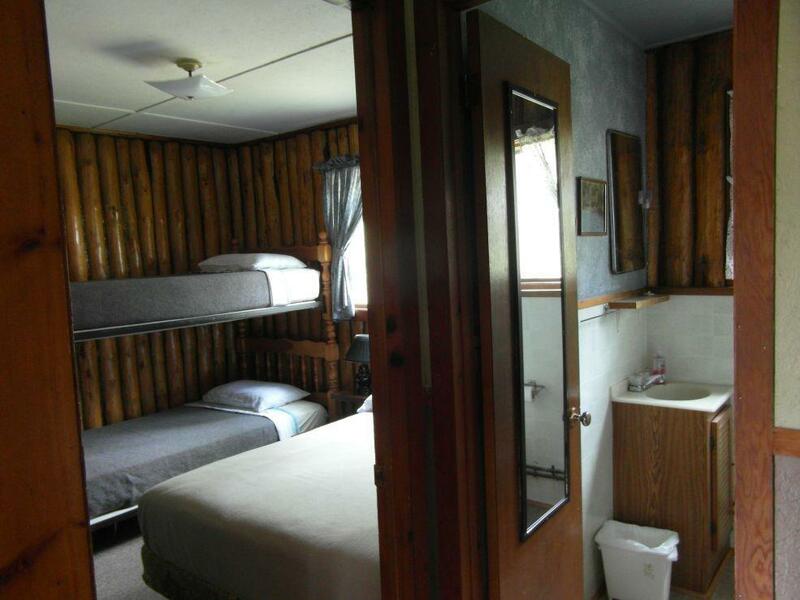 1 Queen Bed, 1 Double, 2 Singles and satellite TV. 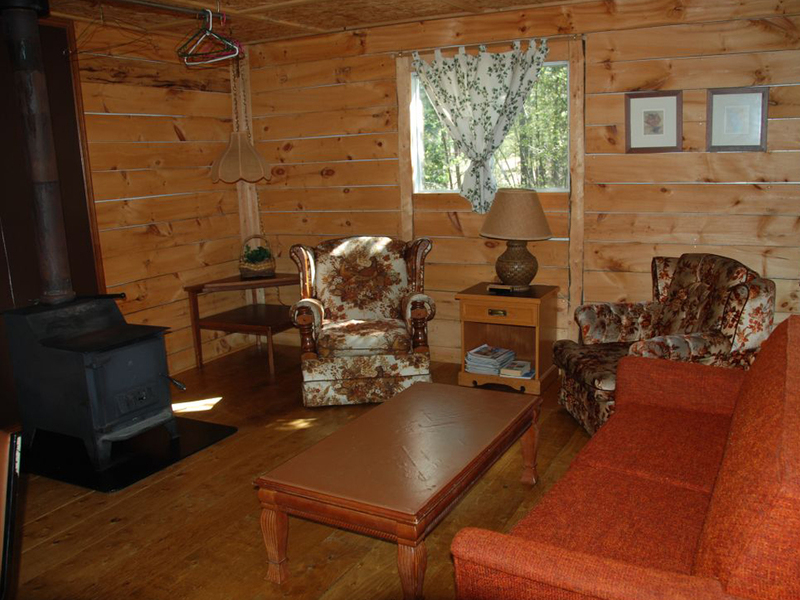 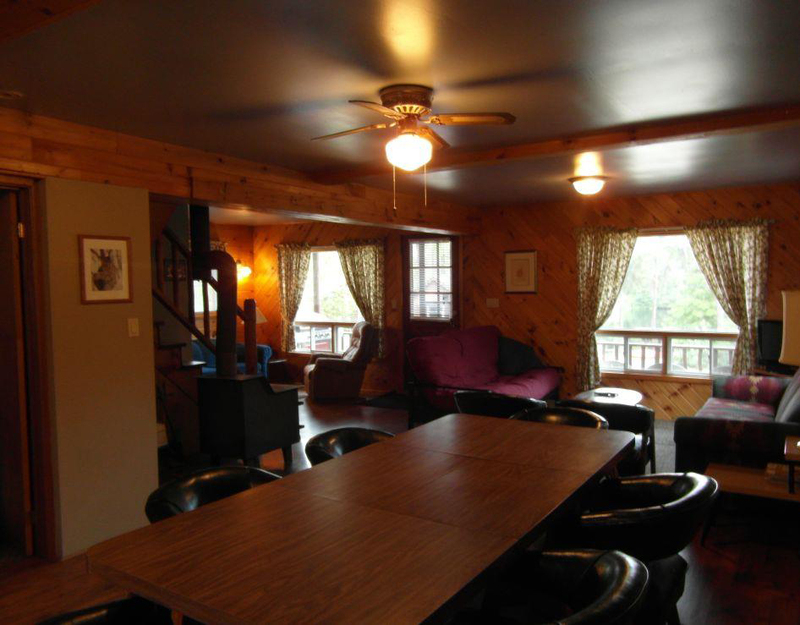 Perfect for your large group – our newest cottage is fully winterized with gas heat. 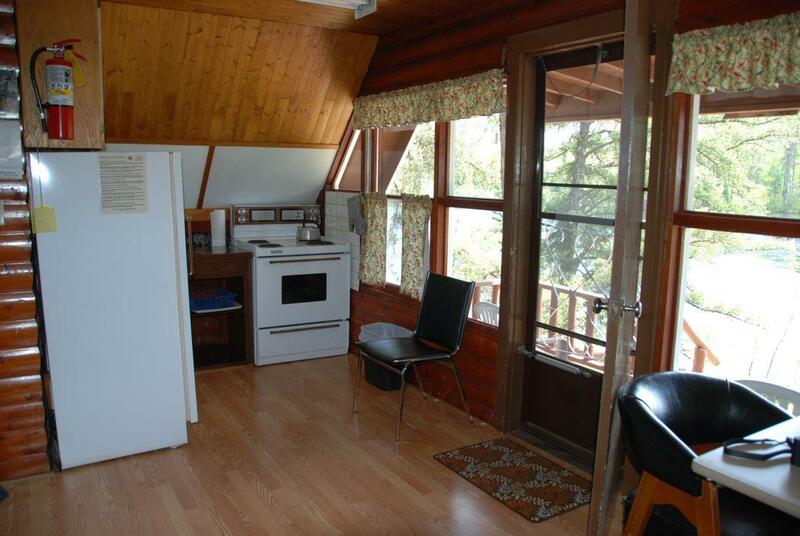 Very large living area, two bedrooms, spacious bathroom with corner shower, and two closets. 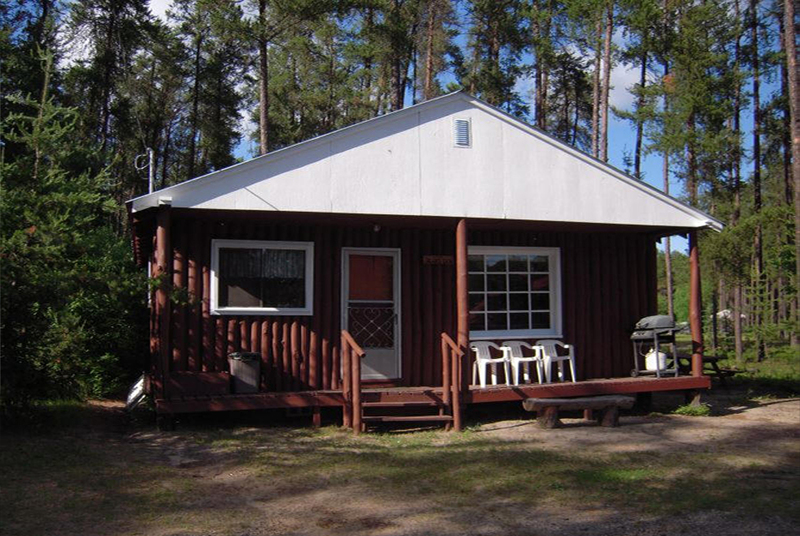 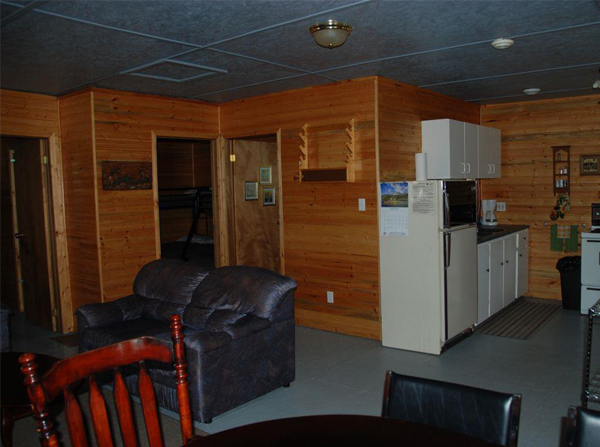 Very private – set in the pine forest at the back of the camp. 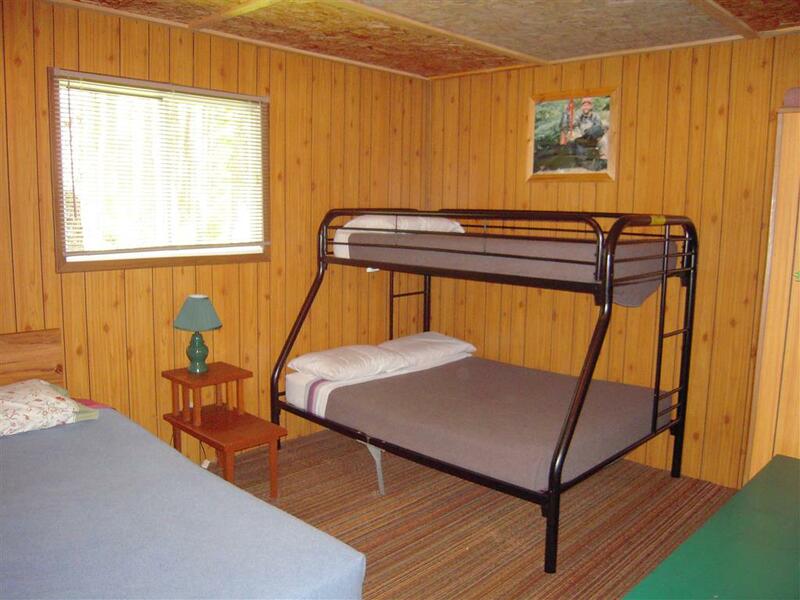 3 Double Beds, 3 Singles, a pull-out sofa and satellite TV. 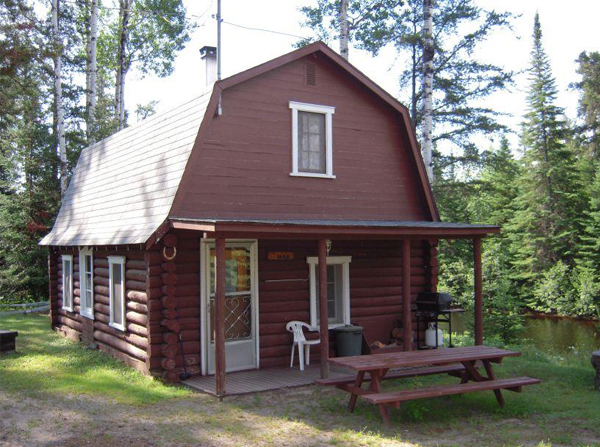 Charming two story log cottage in front of main lodge. 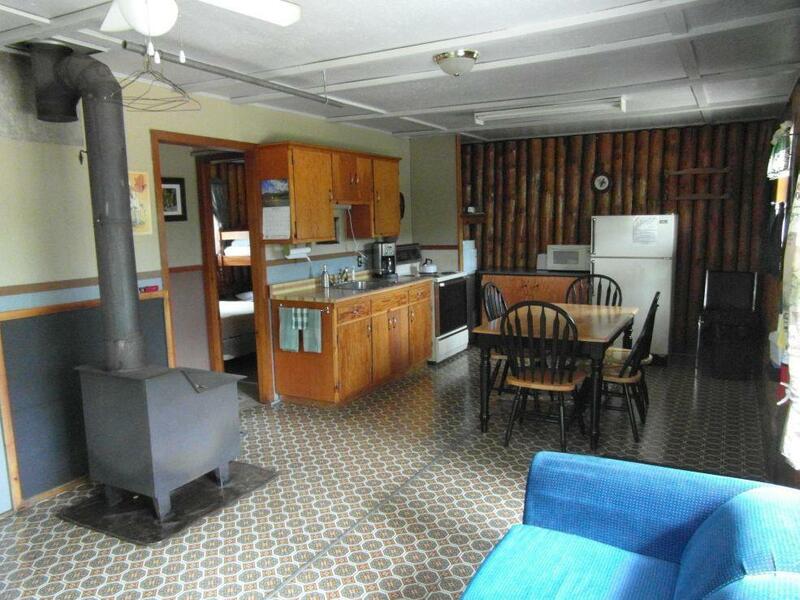 Open first floor has kitchen, bathroom, and living area with pull-out sofa and woodstove. 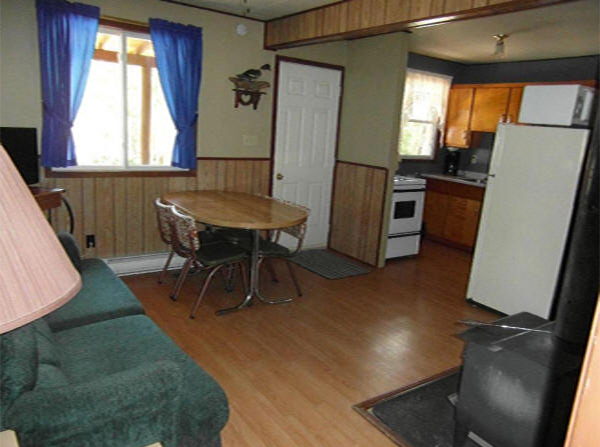 Three bedrooms upstairs with 3 Double Beds and 3 Singles. 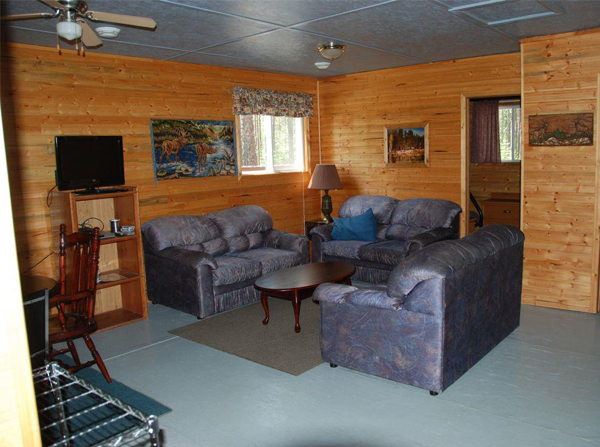 Now has satellite TV. 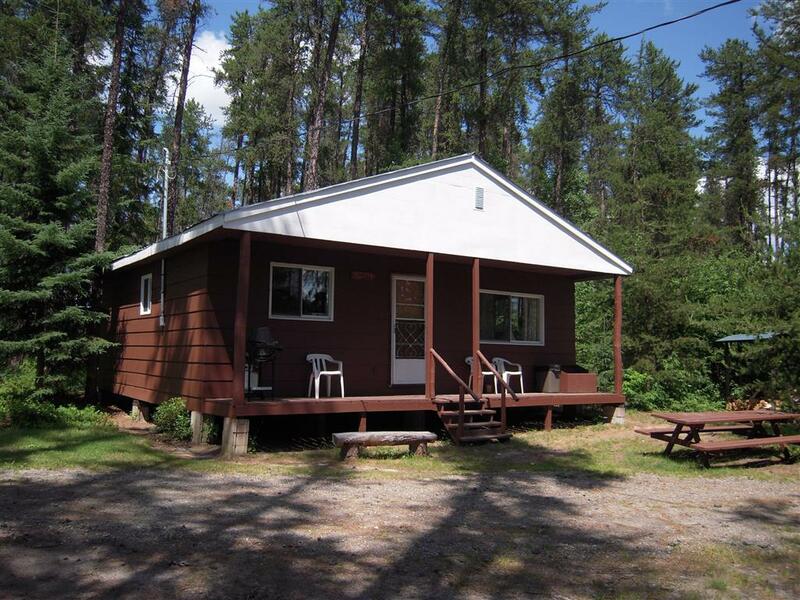 Waterfront cottage set in a small grove of pine trees. 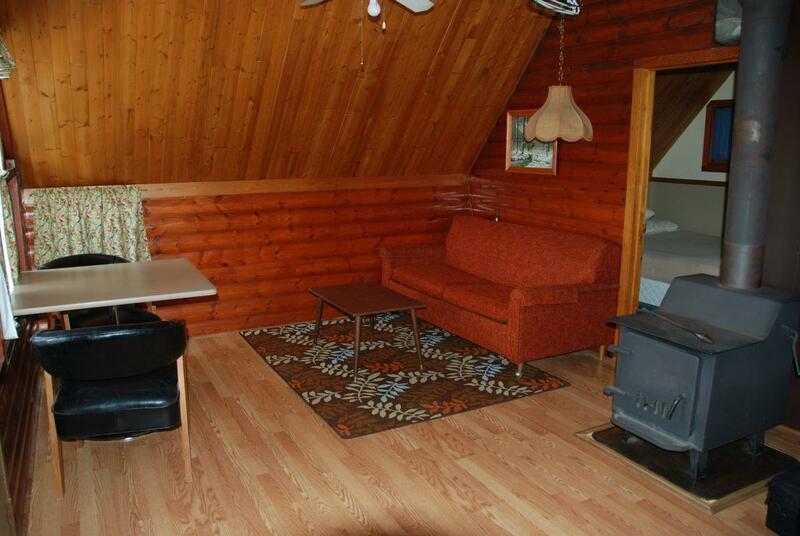 Two bedrooms with 1 Queen Bed, 1 Double, 2 Singles, a pull-out sofa and a woodstove. 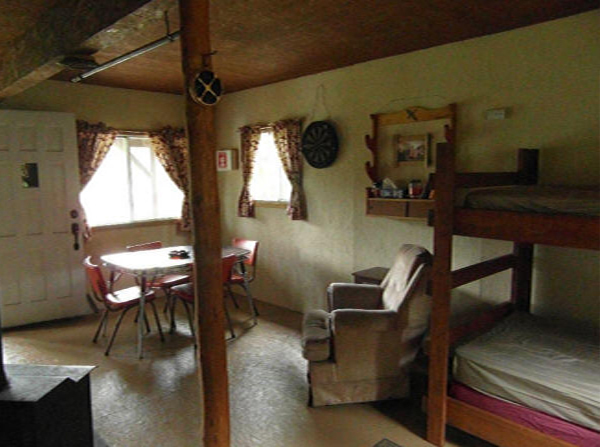 The most requested cottage in the camp! 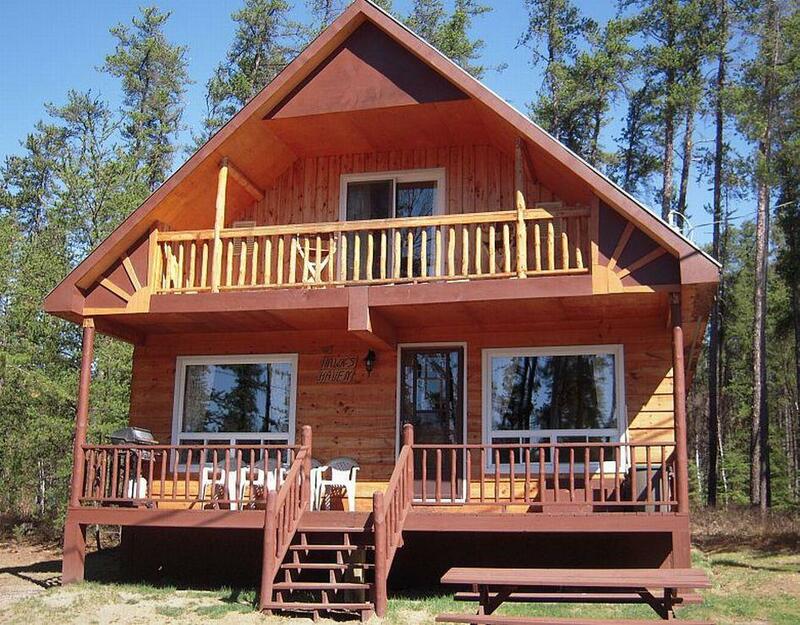 Enjoy the gorgeous view of the water from the front porch or second story balcony. 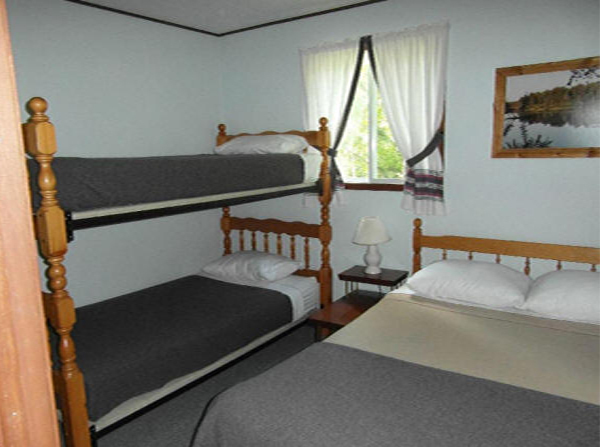 Three large bedrooms with 6 Double Beds, 1 Single, a pull-out sofa and a futon. 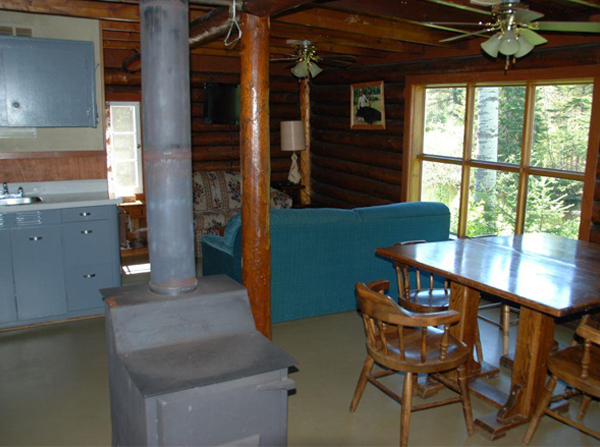 Fully winterized with electric heat and a woodstove, a whirlpool bath tub and satellite TV, this cottage has it all! 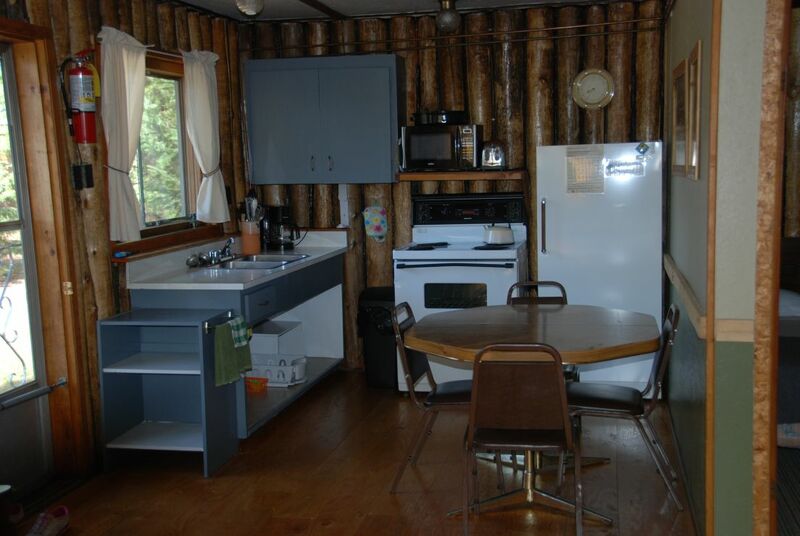 Vertical log cabin just a few yards back from the water’s edge. 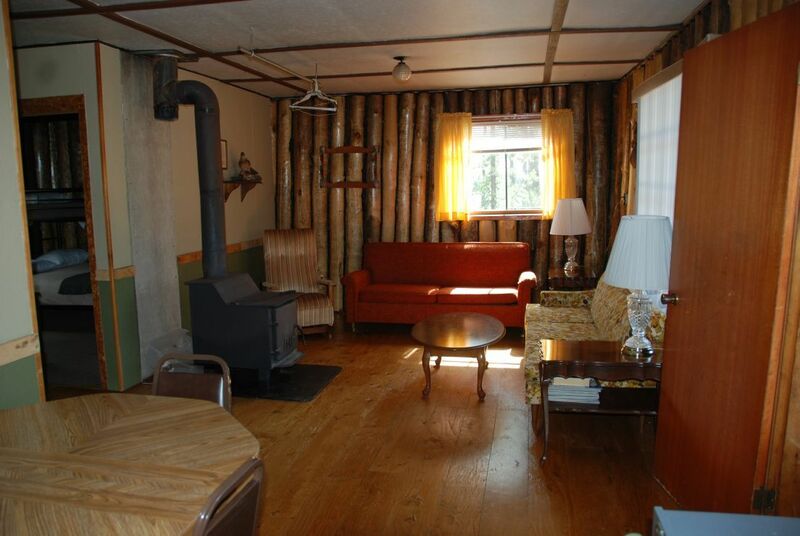 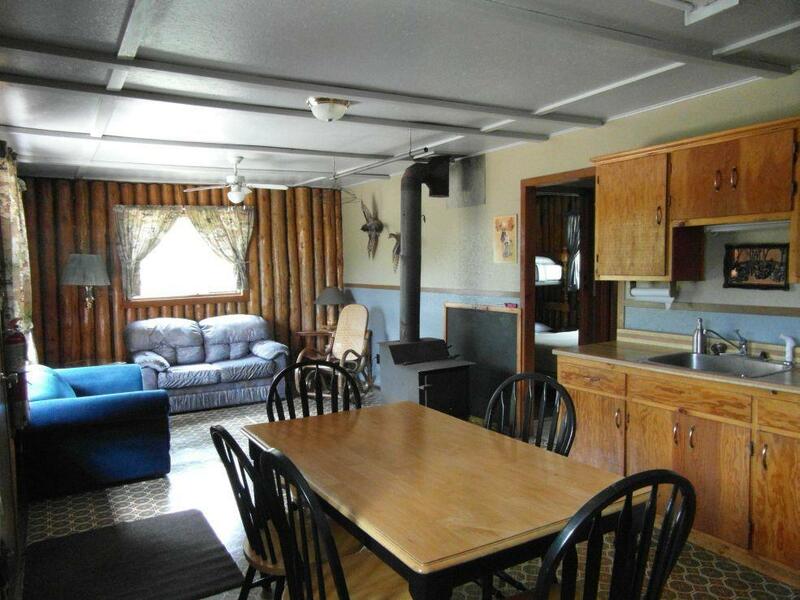 Large living area with a woodstove, two bedrooms with 2 Double Beds, 4 Singles, and a pull-out sofa. 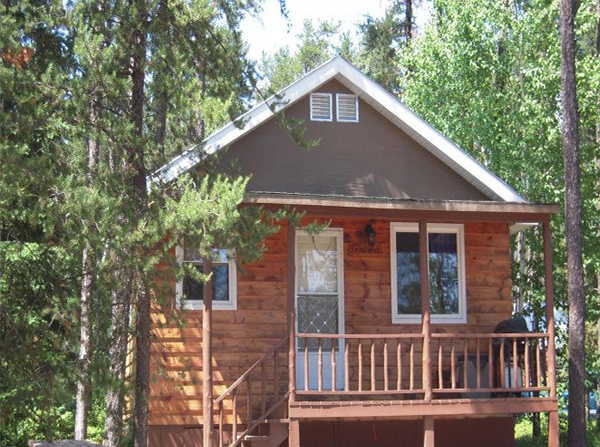 Spacious cottage set back in the trees. 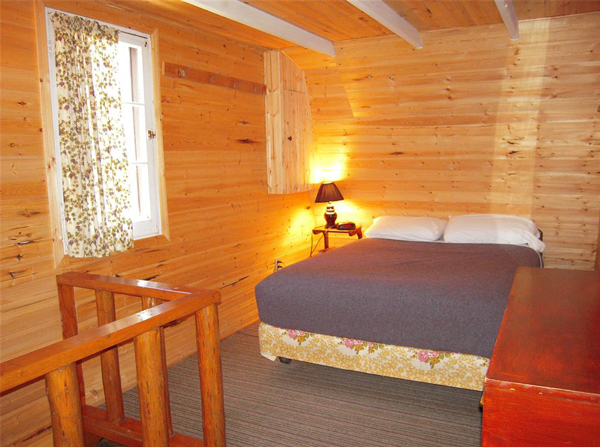 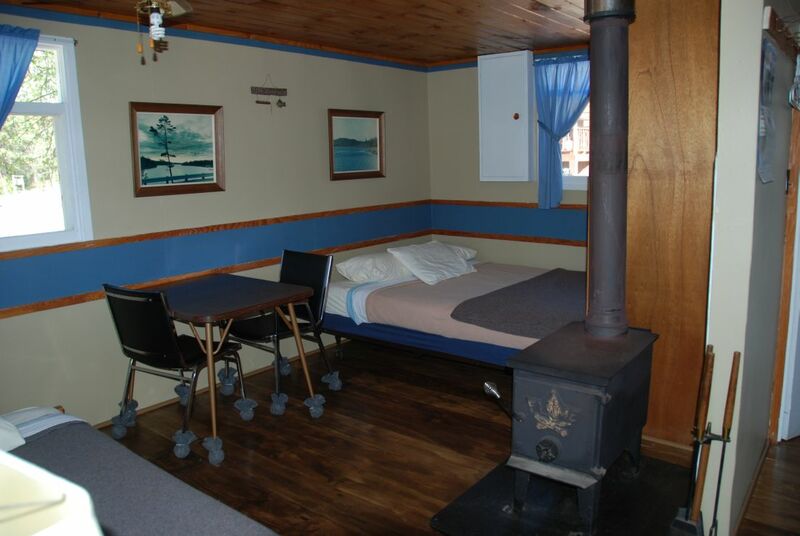 Two large bedrooms with closets, 2 Queen Beds, 2 Double Beds, 2 Singles, a pull-out sofa, woodstove, and satellite TV. 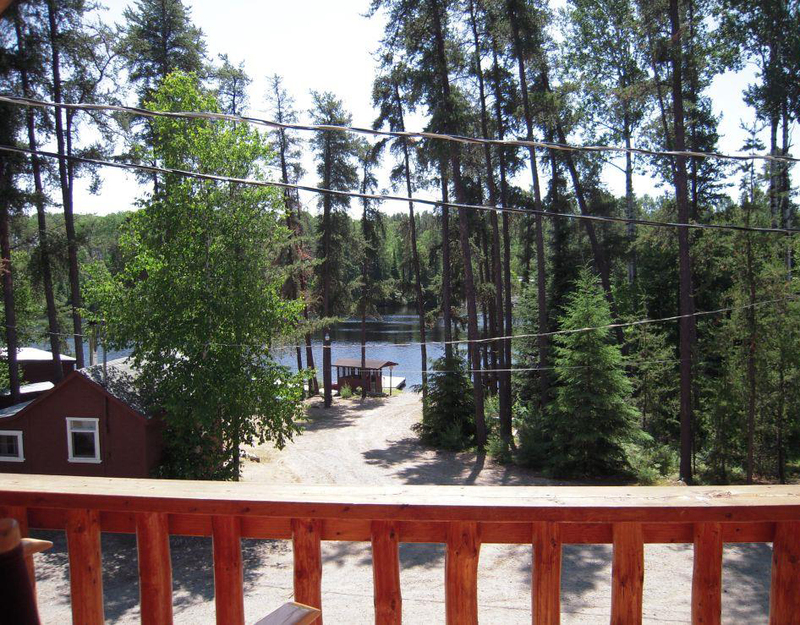 Great view of the water and boat dock! 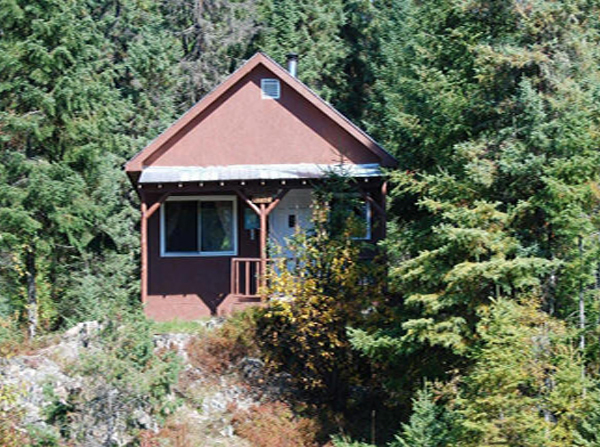 This cute one room cottage still has a fully equipped kitchen, a woodstove, and a bathroom – only smaller! 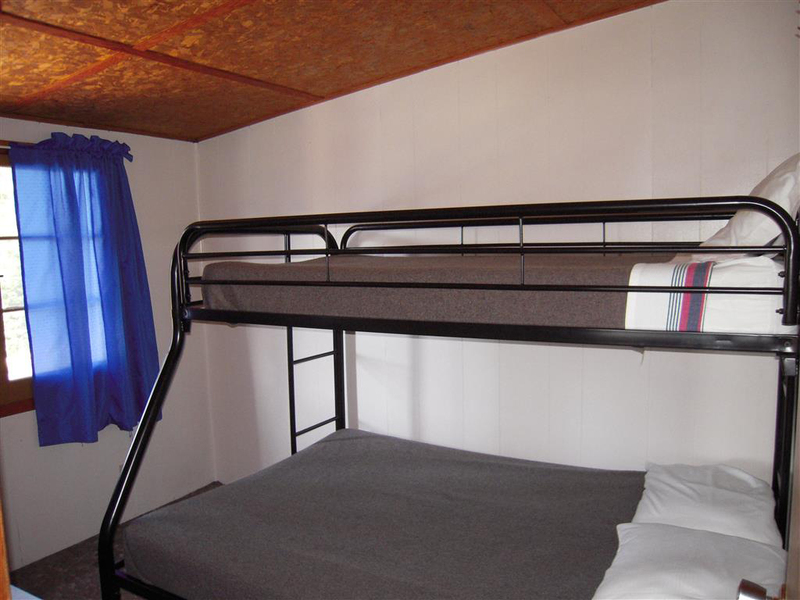 1 Queen bed and a single day bed. 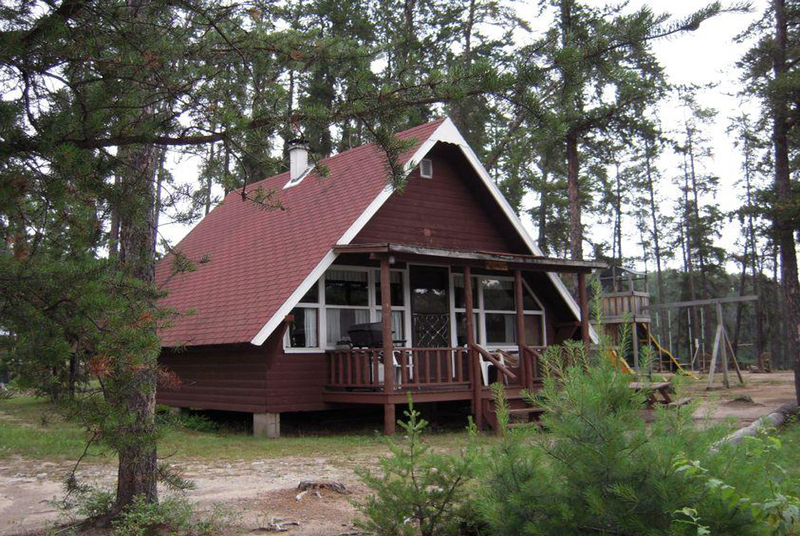 Very popular, adorable “A” frame cottage located on the shore of Sydney Creek. 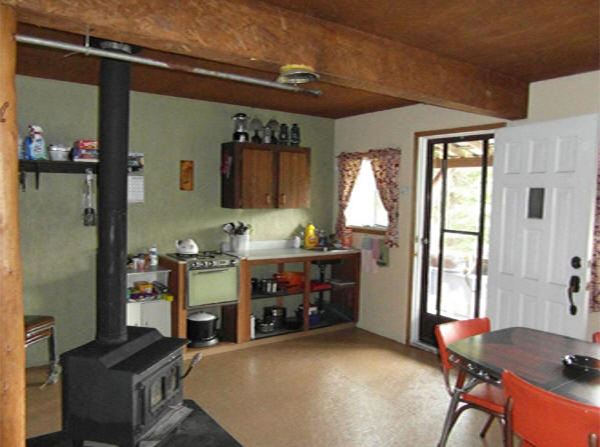 Two bedrooms with 1 Queen Bed, 1 Double, a pull out sofa, and a woodstove. 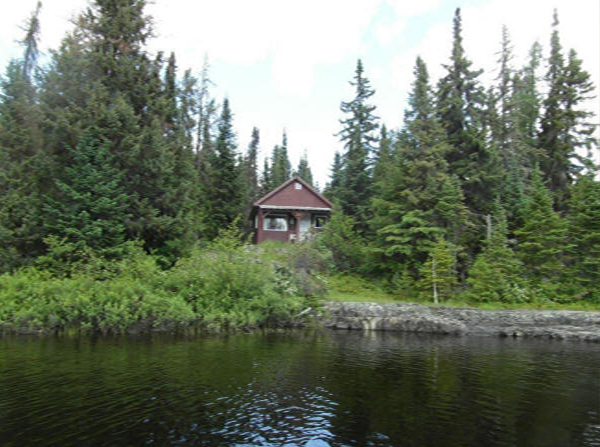 Boat-in only, very secluded, approx. 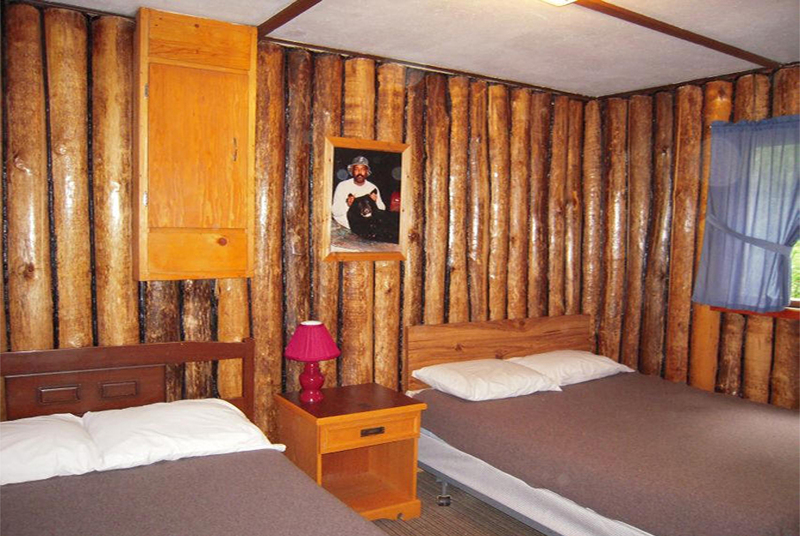 ½ hour from main camp. 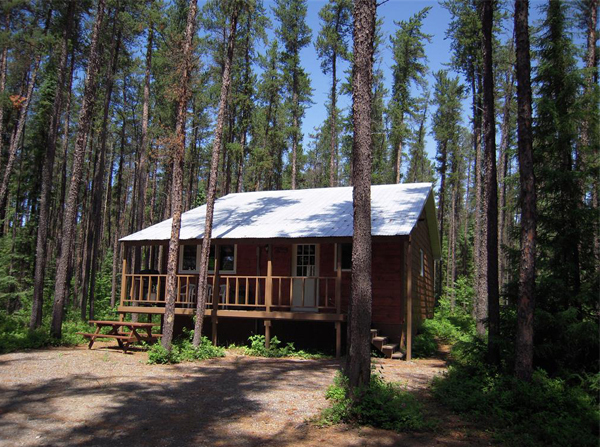 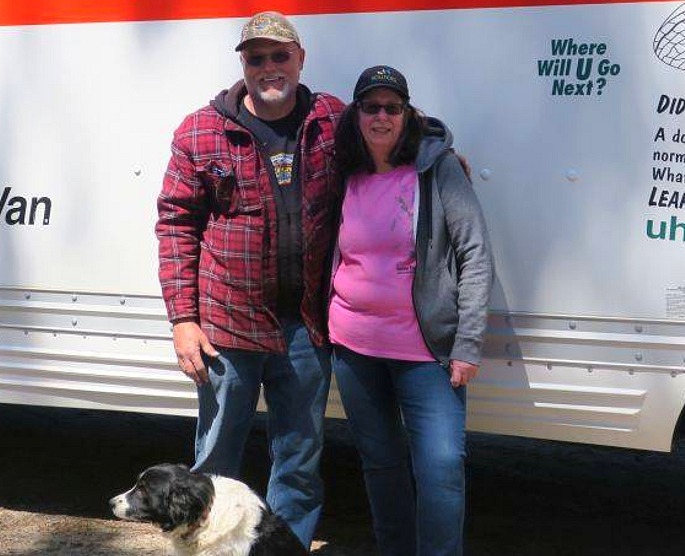 No electricity or running water, one room cabin with 4 single beds, woodstove, outhouse, propane stove/oven & BBQ. 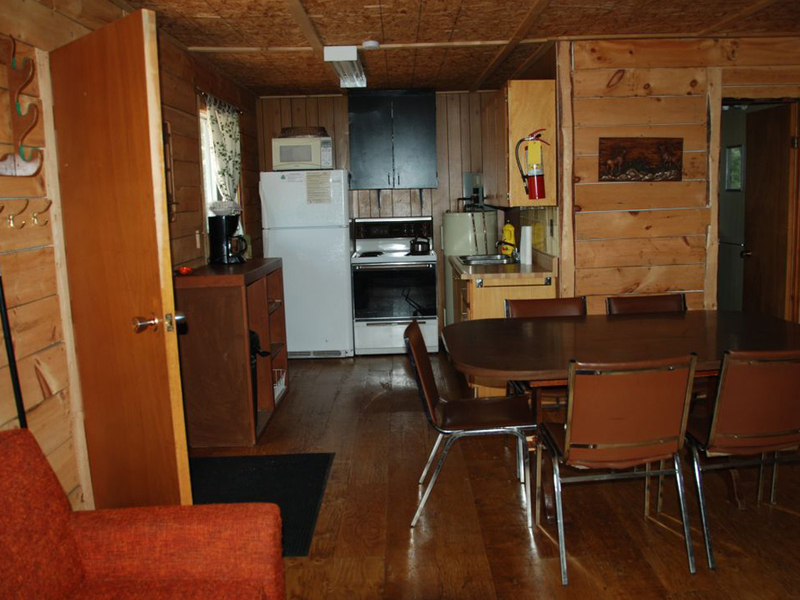 No refrigerator or bed linens, please bring coolers and sleeping bags.